This is part 3 of 4 in our series: Elite Player Workouts. 1-Hand form shots-Make 3 shots from 5 spots (3-5 ft from basket) repeat from 10 ft. Add guide hand and repeat the drill. Spot Shooting-Make 3 shots from all seven spots on the floor. ***This is 100% live. Use your rocker step or quick hop form, along with proper form you worked on during form shots. 2 Minute Shooting (NOTE: Need a teammate to rebound/pass)-Put 2:00 minutes on the clock. Make 2 shots from each of the 7 spots on the floor. Once you make it around the arc, you have to repeat the drill and make it back to where you started. 28 game speed makes in 2:00 minutes to complete the drill. 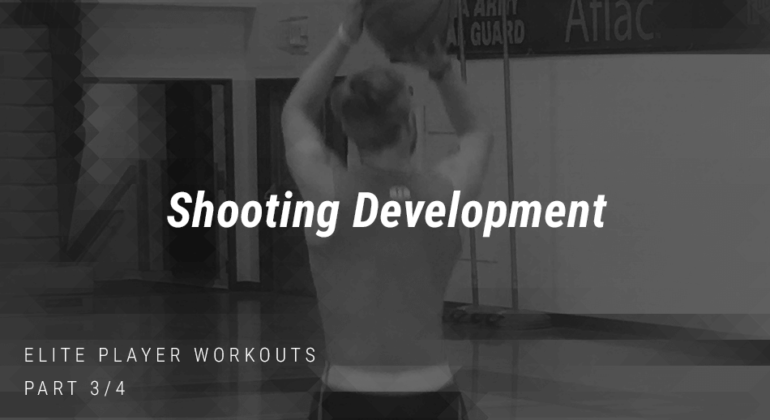 Note: All of these drills are designed to make you a better shooter OFF-Ball. Learn how to move and space without the ball to take your game to an ELITE level. Slide and Shoot (Note: Need a partner to rebound and pass)- Slide around the arc while working on your 1-2 shooting or quick hop; make sure not to cross your feet and keep a low “shot ready” base. Cone Shooting-Place cones on the 7 spots on the floor. Start underneath the basket and cut around each of the cones receiving a pass you clear the cone…..rise up using “inside foot” shooting technique to shoot your shot. Using Off-Ball Screens (Note: Use a chair, trashcan, or cones as your screener)-Make 5: curl lay-ups, curl jump shots, straight cuts to jump shots, fade cuts to jump shots and backdoor lay-ups. Spot Shooting Pull-Ups-From 7 spots on the floor make 1 pull-up going each direction. Alternate going left-right. Repeat drill using a 1-dribble pull-up and 2-dribble pull-up. Partner Close-outs (Note: Need a partner to simulate defender)-Defender tosses ball to offensive player, on the catch offensive player will attack the defender’s hip. Offensive player will rip by the defender to shoot a pull-up, shooter/offensive player grabs own rebound and repeats the drill with partner. 15-20 reps around the arc. This is part 3 in a series of posts put together to help you become an elite player, including a bonus section to ensure you get the most out of your time in the gym. Great players and great teams do more than what’s required, love to be coached, accept criticism, master the fundamentals and are passionate about practice!